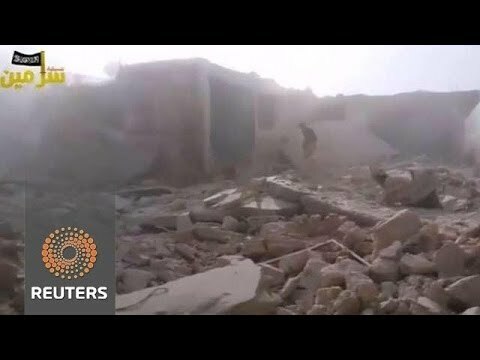 In a big setback for the Obama administration’s Syria policy, the al-Qaeda affiliate Succor Front (Jabhat al-Nusra) took the town of Deir Sunbul and its environs this weekend away from the Syria Revolutionaries Front, a relatively secular-minded group viewed as “moderates” by the United States. Deir Sunbul lies in the Jabal al-Zawiya region of the northwestern province of Idlib. The pan-Arab London daily al-Quds al-Arabi (Arab Jerusalem) says that the regime of Bashar al-Assad in Damascus is rubbing its hands with glee at the prospect of the rebels fighting one another to exhaustion. Not only did Syria Revolutionaries Front leader Jamal Marouf have to flee his hometown, but some of his fighters actually turned on him and joined the Succor Front. The Succor Front launched its attack with an armored convoy coming from the eastern desert and deployed tanks and armored vehicles against Deir Sunbul’s pitiful little machine gun batteries. 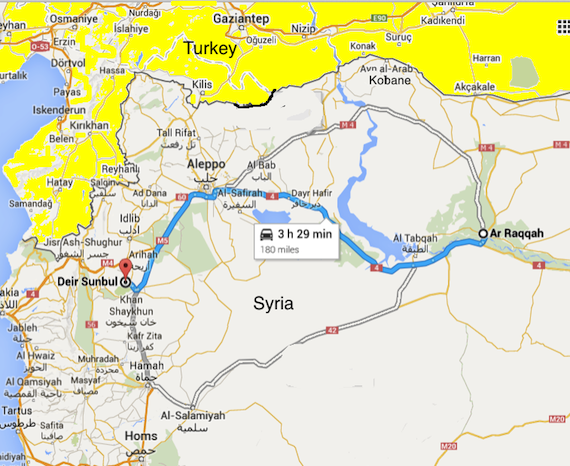 This operation raises the question of why the US did not bomb the convoy. Jamal Marouf’s group in any case had sometimes fought alongside Syria’s al-Qaeda and last April said al-Qaeda was the West’s problem, not his. (Ouch!) He complained that aside from a one time payment some time ago of $250,000, he hadn’t received any appreciable aid from the West. The loyalties of fighters may also have to do with which group is seen as more indigenous and which as foreign agents. The Succor Front response to Jamal Marouf rebukes him for trying to code the al-Qaeda affiliate as foreign agents. But now that the US is openly siding with the Free Syrian Army and conducting bombing raids against ISIL and the Succor Front, it is moderates such as he that are in danger of being tagged as agents of Western imperialism. If he in fact hasn’t gotten much help from the US, this outcome would be unfortunate. Even more disturbing, McClatchy correspondents reported that the Succor Front (Jabhat al-Nusra) attack on Deir Sunbul was aided by ISIL fighters. ISIL and Succor, despite both being radical fundamentalists, have been alienated from one another and fighting one another for the past 18 months. ISIL has had a policy of attacking its fellow rebels more than it attacks the Syrian army, which has made it the skunk at the rebel Syrian party. But if it actually learns to be an ally, it could widen its coalition. 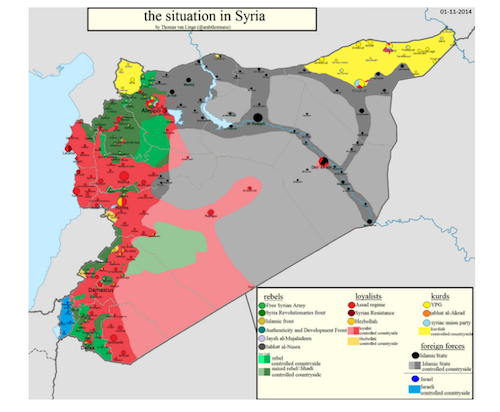 A joint al-Qaeda – ISIL campaign against the Free Syrian Army groups in the northwest could cripple them. The infighting between the rebels has given hope to the Syrian Army. It has advanced on Khan Shaikhun in Rif Idlib, and has is eye on expanding its sway in Idlib and breaking the siege of its strategic Wadi al-Dayf military base. It now serves as a forward operating base in the region controlled by the Succor Front. ISIL itself has faced a setback in the past few days, however, as a mini-civil war broke out among its ranks in its capital of al-Raqqa. There, says al-Quds al-Arabi, the Uzbek foreign fighters have been clashing with the Chechens over control of key buildings. The Uzbeks appear to have the upper hand because they are more numerous. ISIL leader Ibrahim al-Samarra’i, who styles himself a caliph, is said to have been forced to leave Mosul and return to Raqqa because of this crisis.